Unless you know the address, you’ll likely never find Aguilera’s Café. And unless you go now, you’ll likely never enjoy the tiny menu cooked by 88-year-old veteran/owner, Santos Aguilera. Run out of a white house with a sea foam-colored trim and no signage (it’s on the inside), this 56-year-old Fort Worth institution is dimly lit with a smattering of fading booths and tables under WWII memorabilia (check out the pin-up propaganda poster with the words, "I wish I was a man. I’d join the Navy"). An ornate, carved bar leads the way to the kitchen. 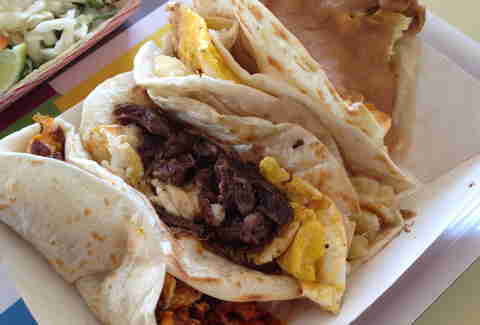 Of the two breakfast tacos available, the carne guisada -- with cubes of beef that look to be instruments of chewy torture draped in chile sauce, but are really fork-tender morsels in a flour tortilla -- is the must-order. And order you must -- soon. When Santos passes, so will his restaurant. The renovations needed to bring up to code a structure that was grandfathered in after current building regulations were put in place are too costly for Aguilera’s son and family. Heck, if the dining room gets smoky, the ventilation system used to remove it is an open front door. Call ahead. Saturday morning hours are erratic. Its Cultural District location means Salsa Limón does a brisk business during marquee events such as January’s Fort Worth Stock Show & Rodeo. Good thing the breakfast tacos are worth waiting in line for. The potato and eggs with black pepper recoil. The chorizo is sloppy — in a good way. 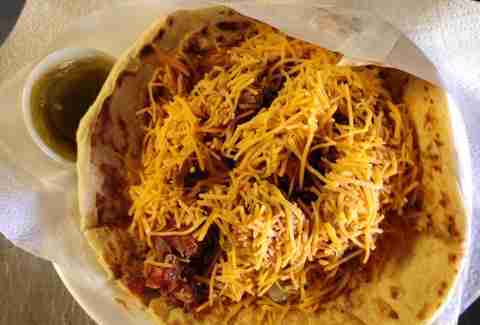 The just-fatty-enough barbacoa made from beef check is chunky, and refried beans and cheese should be slurped. 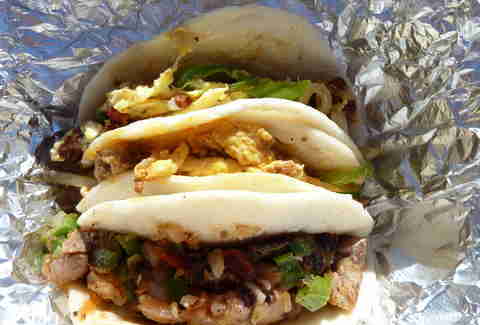 Unless otherwise requested, all the breakfast tacos come with eggs that have been fried and chopped on flattop griddle. At Salsa Limon Museo, the eggs are topped with the barbacoa. Better to ask the staff to hold the eggs or indicate you’d prefer them mixed. It should come as no surprise that a barbecue joint, not to mention one in a gas station, would serve breakfast tacos -- killer ones at that. 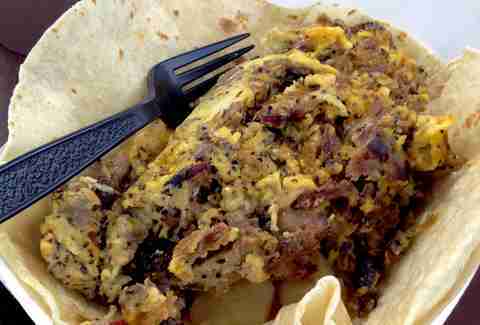 The house-made flour tortillas cradling a taut, peppery mess of smoky brisket, rib meat, or pulled pork and scrambled eggs make for large morning starters and fuel the many truck drivers who fill up their rigs at the Cresson, Texas spot. They’re big enough to get you through the drive from its address to Fort Worth, Dallas, or any point in North Texas. Weekend barbacoa is a time-honored Lone Star State breakfast tradition, especially in South Texas, where the best barbacoa de cabeza de res (beef-head meat barbacoa) is found. Folks in Dallas-Fort Worth hankering for the silky meat don’t need to drive 10 hours toward the Rio Grande Valley, though. They can head -- heh -- to Taqueria Laredo along Highway 67 in Oak Cliff. The restaurant is opened Fridays, Saturdays, and Sundays only, with barbacoa available on the latter two days. The silky meat rests easily in a flour tortilla that, when unfolded, is the size of a child’s tricycle wheel. 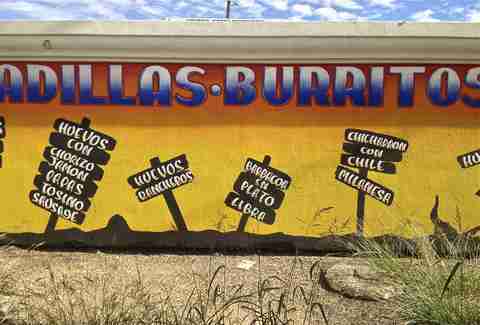 Look out for the painted signposts that read, "Chicharron con Chile, Barbacoa en Plato Libra, Huevos con Chorizo, Jamon, Papas, Tosino [sic], Sausage." You’ve got a bona fide stop on the taco trail, right here. What began as hole-in-the-wall joint in an eco-conscious fueling station has grown into a locally treasured taco spot in East Dallas. The restaurant, from Owners Jeana Johnson and Colleen O’Hare, is decked out in recycled and reclaimed trappings and puts out next-level breakfast tacos made with locally sourced ingredients. Prime among them is the SoCo: a flour tortilla hugging a Southern breakfast of scrambled eggs, chunks of biscuit, breakfast sausage, and sausage gravy that gets a cap of shredded cheese. It can send you back to bed, whether or not you drink a cup of joe from the Cultivar Coffee counter. But what a wonderful sleep aid it will be! Unlike The Doctor’s TARDIS, this cinderblock structure on Fort Worth’s Northside is smaller on the inside than it is on the outside. There are no indoor seats, only a broken tile counter with a handwritten menu propped against a wall, an old stove, and some coolers. Four people at the counter forces a line to form on the sidewalk outside. But the queue moves quickly, thanks to a limited menu, offering variations on items with chicharrones (fried pork skin), refried beans, pork roast, and/or potatoes. The price tags can be off-putting. Still, if you order Granny’s most popular taco, a six-dollar beast of thick, crunchy chicharrones in a salsa roja, refried beans, and firm potatoes bound by a net of melted orange cheese in a flour tortilla that flirts with identifying as a pita, we bet you’ll be more than satisfied with bill. 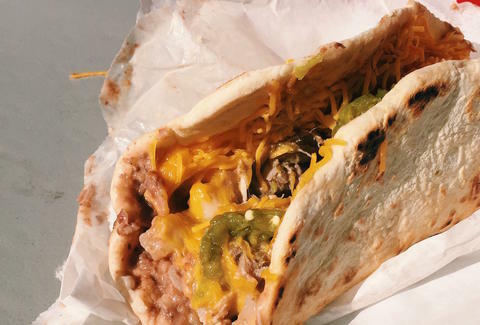 It’s the kind of taco that could be a TCU football player’s undoing. The chicharrones is worth it. Go "all-in" at Taco Stop. The deluxe breakfast taco order is jammed with scrambled eggs, bell peppers, onions, and bacon or chorizo -- giving you sweet and salty turns with crunch in either a corn or flour tortilla. 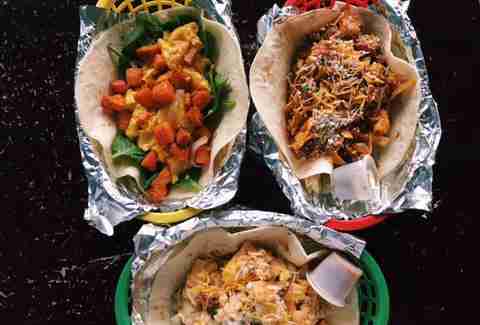 There are other breakfast tacos at this nearly three-year-old walkup taqueria in the Dallas Design District, but we recommend going big first. If you arrive after 10:30am, snag the barbacoa, tender and luscious in a small corn tortilla. It’s shot with pico de gallo that induces the occasional hiccup bout. If that’s not enough heat, reach for the salsa chile de àrbol. Your taste buds will sizzle in the best possible way. 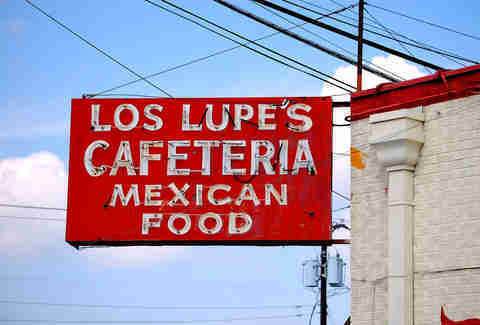 The tired red and green neon sign juts out from Los Lupes Restaurant’s corner entrance, but when on it’s difficult to make out even on a drab day. The interior shows its age, yellowed and tired with faded beer signs and a neglected ordering booth to the right side. A side dining room, much larger than the front space, is populated with vinyl booths and Mexican soccer-Budweiser memorabilia. Did we mention the bars on the windows? Behind them are Los Lupes’ breakfast tacos. A tomato and cumin wallop is weaved into the carne guisada, while barbacoa comes shiny and earthy. The eggs are wet and the chorizo is as well. A vermillion net streams from the end of the spongy house-made flour tortilla (which can be substituted for corn). The bacon snaps cleanly, the egg and dried, salt beef dish called machacado runs strong, and, if in you’re up for it, you can order no-fuss lengua first thing in the morning.